Free throws in the final seconds prove to be the difference and the young Atlee Raiders girls basketball team emerges victorious in their division championship at the 2013 Boo Williams/Ronald Curry Christmas Classic, 51-50 over Bayside! The Raiders, winners of four straight, improve to 5-3. They were led by emerging star Cierra Shelton with 22 points, while Shelby Hill, who hit the game-winning free throw, added 13. Shelton was named Tournament Most Valuable Player, while Hill was named to the All-Tournament Team. Meanwhile, the Hanover girls fell short in the championship of the Clover Hill Holiday Tournament, losing big to Conference 20, and former Capital District rival, Glen Allen 75-22. In boys action, Hanover took its second win in nine days over rival Atlee in the 7th Place Game in the 2013 Henrico Holiday Hoops Tournament Saturday afternoon. Shaking off an uneven first half, the Hawks cooled off a hot-shooting Raider squad with a full-court press to turn a 38-36 halftime deficit to a 75-59 victory. Jalen Elliott had 23 points for Hanover (6-4), who were led by Cutch Ellis' 24. Jordan Wade added 11. Brian Miller had 23 points for the Atlee Raiders, who have lost seven straight after starting 2-0. R.J. Jenkins added 12. An easy Friday for the Atlee girls basketball team as they advance to their division finals in the 2013 Ronald Curry/Boo Williams Classic in Hampton with a 61-26 win over Currituck County (NC). The Raiders, winners now of four straight, will face Bayside in the finals Saturday at 4pm, 64-62 winners over Phoebus in the other semifinal. Meanwhile, at the Clover Hill Holiday Tournament, the Hanover Hawks advanced to the championship with their second-straight two-point win, a 41-39, grind-it-out victory over Appomattox Regional Governor's School. Hanover, now 3-6, faces Conference 20, and former Capital District foe, Glen Allen in the championship game. The Jaguars (7-3) handled J.R. Tucker 62-40 in the other semifinal. At the Henrico Holiday Hoops Tournament, both Atlee and Hanover fell in consolation semifinal action, setting up at 7th Place game between the Raiders and Hawks Saturday at 2:30. Atlee was outrebounded by Hermitage 52-19 as the Panthers outlasted Atlee 80-63. Brian Miller poured in 33 points for more than half of the Raiders' offensive output. Both teams are now 2-6. The Hawks took the court to play the Jaguars in the Henrico Holiday Hoops Tournament. The Jaguars seeking revenge as the Hawks knocked them off in the championship of the Conference 20 tournament in overtime, 56-53 on December 7th. The Jaguars would waste no time, jumping out to an 11-6 lead. The Hawks, as expected, chipped away. With 1:04 remaining in the first, a jumper by Elliot would give the Hawks their first lead in the game. A late steal and jumper by Josh Harris made it 15-13 Hanover. Collin Dwyer nailed two free throws for the Jaguars to end period one in a 15-15 deadlock. The Hawks would come out roaring with a 6-0 run to lead 21-15, at 3:11 to halftime. Glen Allen matched it to draw even at 21, then picked up the pace out of a Hanover timeout, going on another 6-0 lead to extend the lead at the half to 28-24. Glen Allen played with increased intensity, but it would continue to be a battle as the Jaguars would lead 51-48 mid 4th quarter. Back and forth they went, just like they did twenty days ago on the Jaguars' home court. Hanover drew within one at 58-57, calling time at :50 in regulation. Coaches on both benches beseeched their players to "play smart". Hanover did not, committing a needless mistake, then later fouled Jaguar leading scorer Grayson Midulla. Midulla hit one free throw for a 59-57 Jaguars edge. Ellis responded, dribbling down the court, hitting a jumper to tie the game at 59 with just 11.6 seconds remaining. But Derrick Johnson would hit a floater for Glen Allen and was fouled. Glen Allen led 61-59. Johnson added two more for security, finishing with 12 as the Jaguars survived, and exacted some revenge, 63-59. Midulla led the Jaguars with 23 points. Ellis led the Hawks with 17, but credit Glen Allen on shutting down point guard Jalen Elliott, limited to only nine. Josh Harris added 12 points off the bench. Glen Allen will advance to play Hermitage in the 5th Place Game at 4pm Saturday, while Hanover will play county rival Atlee for the second time in nine days for 7th Place at 2:30, both games at Henrico High School. (Editor's Note: As for Glen Allen and Hanover? They play two regular season games on January 13th (at Hanover) and February 7th (at Glen Allen). It's also very conceivable the Hawks and Jaguars could meet a fifth time in the Conference 20 Tournament come mid-February, when the season is on the line. Expect all four...or five...games to be as close as the first two. Atlee and Hanover both fall in first round action Thursday at the 10th Annual Henrico Holiday Hoops Tournament at Henrico High School. Atlee fell to the homestanding Warriors 69-57 and will play Hermitage in Friday's first consolation bracket semifinal at 2:30pm. Hanover ran into a contender for the 5A state title in unbeaten Potomac from Prince William County. The Panthers go to 8-0 with a 76-58 victory over the Hawks, who fall to 5-3 and face familiar foe Glen Allen in the second consolation bracket semifinal at 4pm. The percentages are shocking. 25 percent from the free throw line alone. Patrick Henry played 10:59 of solid basketball at the Siegel Center in the Times-Dispatch Invitational Tournament 3rd Place Game Monday against Hermitage, taking a 12-5 lead after a quarter. Then the ice man cometh. The Patriots could neither find the basket nor find a way to keep Hermitage off the glass on both ends of the floor, and the Panthers clawed back for a one-point halftime lead. The flow was the same for most of the second half until, with under three minutes left, down 33-29, the Patriots zipped to an 8-0 run. Amber Lee and Summer Price each hit two baskets to give Patrick Henry a 37-33 lead with 39.6 seconds left. Destini Walker drove the court, got the traditional three-point play to cut the lead to 37-36. After Price missed the front end of a one-and-one, Walker drove the court but was way right on her potential game-winner. India Coles got the rebound and was fouled with 4.3 seconds left. The Patriots called time to draw up what to do, hoping Plan A, two made free throws, would force the Panthers into a three-point prayer to tie. But Coles, too, missed the front end of the one-and-one, Walker rebounded, and zoomed down the court. Her three-point attempt as the buzzer sounded was short, knocking off the left corner of the rim, but the whistle echoed throughout Siegel Center. Summer Price was called for a foul, giving Walker three free throws with no time remaining. She calmly sank the first two to clinch the victory. The 38-37 victory improves Hermitage to 7-2 on the season, as Walker had 25 of their 38 points. For the Patriots, Price had 16, Lee 15, and they fall to 7-2 going into the holiday break. They'll need to shake this loss off quickly, so there's no hangover come January 7th when they return to action against Douglas Freeman. T-DIT Tournament: PH Girls Win Opener over Meadowbrook! In a battle of unbeatens Friday night at Trinity Episcopal School, Patrick Henry rode the first half scoring of Amber Lee and the second half scoring of Summer Price to lead from tip to buzzer in a 59-46 win over Meadowbrook in the opening round of the 19th Times-Dispatch Invitational Tournament. Lee knocked in 14 of her 19 points before intermission, helping the Patriots to a 29-22 lead. Then Price took over, scoring 22 of her game-high 32 points in the second half. For the game, she shot 12-of-13 from the charity stripe, taking advantage of the dribble drive to draw Monarch fouls for trips to the free throw line. Patrick Henry improves to 7-0 while Meadowbrook falls to 6-1. 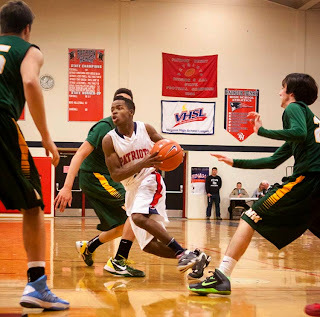 The Patriots next face Cosby, the top ranked team in the region, Saturday at 5pm in the T-DIT Semifinals. The Titans knocked off Glen Allen in first round action 58-47. Cosby has been a thorn in the Patriots' side in recent years, knocking Patrick Henry out of the old Central Region postseason tournament in each of the past two seasons. The game will be played at Crenshaw Gymnasium at Randolph-Macon College right in Ashland! In their final match before the holiday break, Patrick Henry and Hanover locked horns Thursday night in the Brock Center at Randolph-Macon, with the Patriots taking the victory, 95-75 in Girls competition, 100-69 in Boys. The Hanover boys and Atlee girls were victorious at these archrivals met for the first of two regular season matchups tonight at Atlee High School. The Raider girls won their second game in a row after a slow season start, defeating Hanover 51-41. Atlee next plays the weekend after Christmas in the annual Boo Williams Holiday Tournament in Hampton Roads. In boys action, Jalen Elliott poured in 33 points and Cutch Ellis added 21 as the Hawks improved to 5-2, ending a two-game skid with an 83-68 win over the Raiders. It was Hanover's first win since a victory eight days ago over another county rival, Patrick Henry. Brian Miller almost matched Elliott point for point with 30 to lead the Raiders, who, after a 2-0 start, have now lost four straight. Both teams will participate in the 2013 Henrico Holiday Hoops Tournament beginning a week from today. Atlee will open the tourney against host Henrico at 2:30pm while Hanover will face Potomac, one of the top teams in the state in 5A classification, at approximately 7:15pm. NOTE: HCS Media Network will provide LIVE coverage of the entire first round of the 2013 Henrico Holiday Hoops Tournament, including the two games listed above, on Thursday December 26th beginning at 2:15pm ET at the link at the top of the page HERE at HanoverCountySports.net! FOOTBALL HONORS: Four Hawks Named to All-4A South Region Team! Congratulations to Scott Denton, Brennan Gary, Jalen Elliott and Terrance Brooks for being named to the inaugural All-4A South Region football team! The complete list is found below. In basketball, the county went 2-6 on this Friday, with two girls teams leading the way to victory. Patrick Henry survived a threat at home from John Marshall to win and improve to 5-0, 51-46 over the Justices. It was 30-30 after three quarters when the Patriots outscored the Justices to seize the victory, scoring 21 in the final eight minutes. Amber Lee had 20 points for Patrick Henry, Summer Price had 19, and Rachel Adams hit two treys for 6 points. Hanover got its first victory of the season with a 58-44 win over Armstrong. Sarah Belcher had 11 points, Taylor Peay added nine as the Hawks improved to 1-4. Meanwhile Atlee was blown out at Highland Springs 96-38. The Springers are a Top 5 team, current favorites in Conference 11. Ashley Weaver had 13 points to lead the Raiders, now 0-3. The Springers, in an unusual quirk of scheduling, played their season opener tonight and are 1-0, traveling to Glen Allen for a 2:30pm matinee Saturday. Lee-Davis fell behind early, a cold start dooming them to trail 20-0 in first quarter. The Jaguars held a double digit lead all night, winning in Mechanicsville 66-33 to move to 3-1 and that matchup with Highland Springs. Future Richmond Spider Alicia Hudalla scored 13 for the Jaguars, while Kerstin Winston and Olivia Tuck each led the Confederates (1-4) with 14 apiece. Lee-Davis next plays Highland Springs, too, this time Tuesday night on the road. In Boys Action: Hanover fell for the first time, 82-68 victims to Armstrong. Jalen Elliott led the Hawks (4-1) with 19 points. Atlee fell behind quickly and watched Highland Springs sprint up and down the court to the tune of a 100-74 win over the Raiders. Atlee falls to 2-2. Patrick Henry hung tough into the second half, but lost key inside man Lucas Pienkowski to injury and fell to John Marshall 62-39. Pienkowski had 16 points before leaving the game. The Justices used a 24-9 third quarter to break open a close game. Since winning their opener against Maggie Walker Governors School December 2nd, Patrick Henry has lost four straight. And in a game heard live on HCS Media Network, Lee-Davis played the part of the pesky puppy that never leaves your ankles alone, staying with one possession of Glen Allen most of the game despite Ladarein Autry's foul trouble. Autry scored two free throws in the first half, committed his fourth foul with 6:14 left in the 3rd quarter. Despite this, Tariq Caldwell and others stepped up on both ends of the floor to keep the Confederates in the contest. Autry returned exactly a quarter later, 6:14 left in 4Q. He managed one FG early, then hit a trey near the buzzer than only counted in cutting the margin of defeat, as Glen Allen survived 46-44 to go to 4-1. Lee-Davis had the ball with 14.6 seconds left down 44-41. Rather than hold the ball for a chance to hit a three for the tie and force overtime, they opted to drive quickly to the basket for two to cut the lead to one, then foul the Jaguars, who were struggling from the free throw line. But Nick Reisenweaver's layup attempt left side was woefully short. Andrew Sergent's putback attempt failed. Grayson Midulla, who led the Jaguars with 19 points, grabbed the board and was fouled. His two free throws put it away. Lee-Davis is now 1-4 and must travel to Highland Springs on Tuesday. 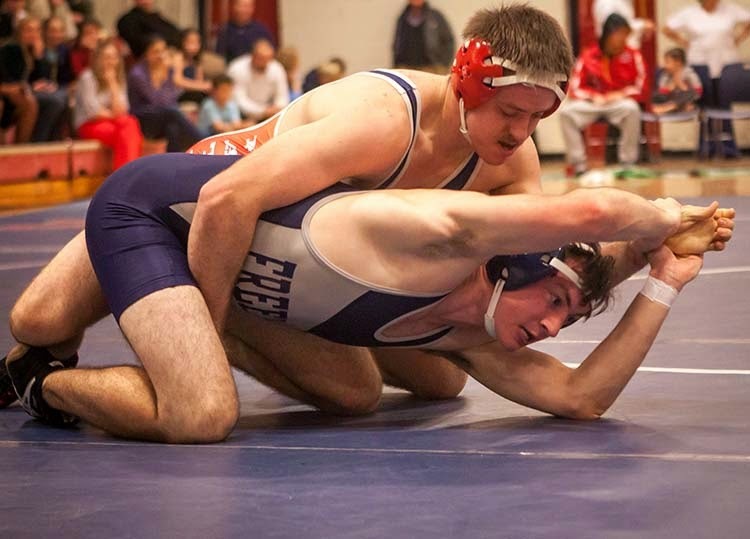 HCS sends our best wishes to Hanover Hawks wrestlers J.D. 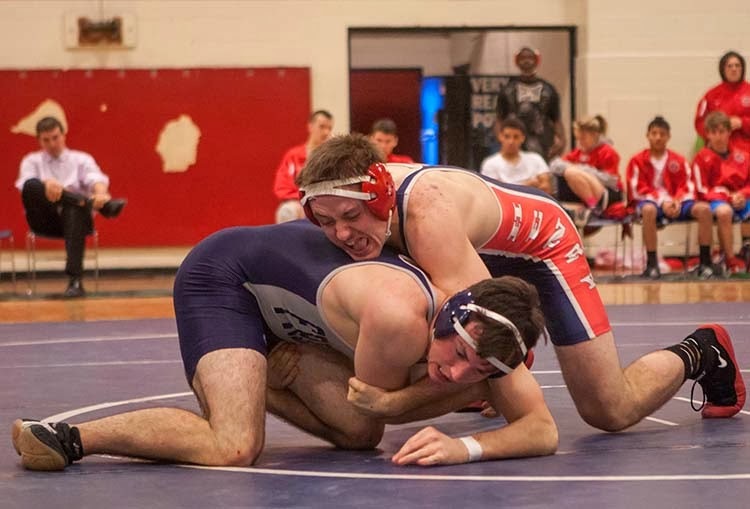 Gregory and Corbin Allen, who head to Ohio today to compete in the Walsh Ironman National Wrestling Tournament this weekend! Gregory, defending state champion at 113 pounds, is wrestling at 120 this year and received a #12 seed for this tournament, while Allen, state runner-up at 138 pounds in 2012-13, is now wrestling at 152 pounds and will begin the Walsh Ironman with a #10 seed. Competition takes places Friday and Saturday; more information on the event can be found by CLICKING HERE! Good luck Corbin and J.D.!!! The Atlee Raiders were victorious Wednesday night over rival Hanover in swimming action at the Brock Center on the Randolph-Macon campus, winning 117-53 in girls, 129-41 in boys. List of winners, top team finishers in events below! 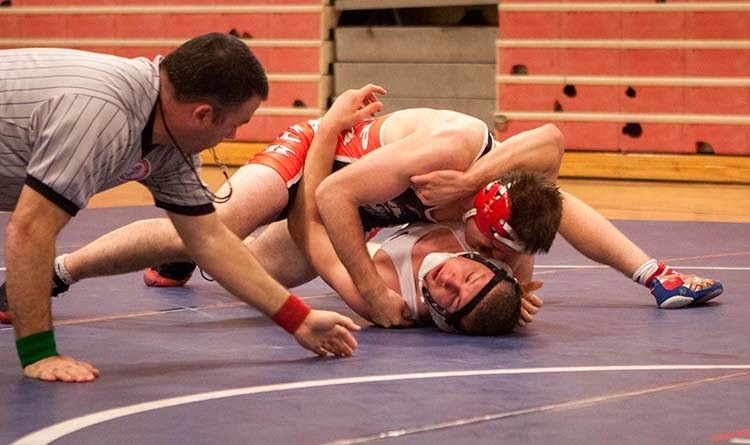 A great night for Patriot grapplers, taking a 58-9 decision over Deep Run in duel action in Ashland! SNAPSHOTS: Patrick Henry Opening Week Swimming Action! 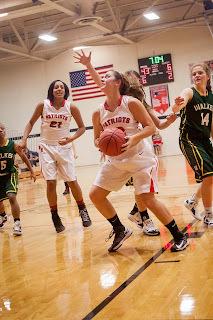 The Patriots opened 2013-14 at home at the Ashland YMCA against rival Lee-Davis Friday and Goochland Saturday. A look at Saturday's action, courtesy of our buddy, @glib49, chief photographer for the Hanover Herald-Progress!! If the first weekend of Hanover's season is any indication, absolutely nothing will come easy this year for the Hawks. After surviving a furious Midlothian comeback in Wednesday's opener and prevailing despite a horrid shooting night against Tucker Friday, the Hawks, to win the Conference 20 Boys Tip-Off Tournament, would have to get past the host Glen Allen Jaguars. And, as expected, the game was nip and tuck, back and forth, and before it was over, they needed five extra minutes. But the Hawks did what they've done all week, survived. Hanover defeated the Jaguars 56-53 to win the inaugural tourney. As they have all week, Jalen Elliott and Cutch Ellis came up clutch when it mattered most. It was a 53-53 tie with a minute left in the extra session. Hanover got the ball, and Elliott found Ellis who hit the eventual game-winning bucket. The Jaguars would miss their chance to tie/take the lead, and had to foul. Josh Harris went to the charity stripe and hit one of two free throws. The Hawks held the final seconds and the trophy was theirs. Hanover, now 3-0, will next host 1-1 Patrick Henry in a county rivalry, non-conference affair Wednesday night in the Bird Cage. Meanwhile, at Douglas Freeman at the Rebel Invitational Championship, the Atlee Raiders looked to capitalize on the momentum received by upsetting the host Rebels in Friday's semifinals 64-60. They would have to battle a tall, quick, disciplined St. Christopher's, a team they scrimmaged recently. And, though they played better against the Saints tonight than in that practice event, it wasn't enough. The Saints shut down Brian Miller over three quarters, utilized a masterful trap pressure scheme, and would run away in the middle quarters to defeat the Raiders to take the tournament title, 66-51. R.J. Jenkins led Atlee with 16 points. For Miller, seven of his 13 points came in the final quarter with the outcome little in doubt. Miller, coming off a 32-point night in the Freeman win, was named to the All-Tournament team. He remembers the frustrations of so few wins last season, and, despite Saturday's outcome, was happy about what the Rebel Invitational experience means to his young teammates. "It's big for our team, big for our program to start off strong in a strong tournament," Miller noted courtside. His head coach, Phil Reynolds, agreed wholeheartedly. "It's incredible. The win against Freeman, first win against a pedigree program since I've been (at Atlee). We went 0-3 last year here, Freeman beat us by something like 35, so our kids are pumped up." The Raiders will go deep this season, and with Reid McCoy and Travis Barton only having two practices with the team since football season ended, once they end the learning curve, the depth only gets stronger. Both played tonight, McCoy scoring four points. He'll be counted on on in the inside for a team that does lack in height. A healthy Ross Gardner will bring height, and critical game experience, back to the team. Gardner, who missed most of the football season with a foot injury, could be back by the new year. Tournament MVP Nick Sherod of St. Christopher's led the Saints with 22 points. The Saints go to 3-0 with wins over Albemarle (a fellow Conference 16 member with Patrick Henry in 5A North), Mills Godwin, and Atlee, all by double digits. They next play at Woodberry Forest outside Charlottesville as they begin private school play Wednesday night. The schedule only gets tougher for the Raiders, as they have their home opener Friday versus Highland Springs, then travel to Varina Tuesday 12/17 and host the aforementioned Hanover Hawks on Thursday 12/19. Sharing is a good thing. Just ask Randolph-Macon women's basketball. The extra look, the extra pass. The Jackets were unselfish, efficient, and dominating Saturday in a 100-61 rout of Hollins University to move to 3-0 in the ODAC, 8-1 overall. All of this accomplished without leading scorer Taylor Huber (21.4 ppg), out with plantar fasciitis in her foot. She'll be in a boot for a week, then re-evaluated, the foot hurt during the Jackets' 81-68 loss Thursday at Virginia Union. Sarah Parsons again led the Jackets in scoring with 24 points, but the next leading scorer was a pleasant surprise: freshman, and Atlee graduate, Stephanie Staples. "Coach gave me a green light to score this morning," Staples said with a smile after the game. "She didn't practice yesterday," R-MC head coach Carroll LaHaye noted, telling HCS Staples had a 101 degree fever Friday. "She got rest, but I didn't get to talk with her much Friday, so I told her today about the Richmond Times-Dispatch write-up the other day that called her a 'prolific scorer' and I said to her that's one of the reasons you're at Randolph-Macon." Staples didn't hesitate, compiling her 16 points in just 17 minutes on the floor, going 6-of-9 from the floor, part of a stellar shooting day all around for the Jackets. They shot 53.8% from the floor, 52.9% from three-point range, and 21-of-24 at the charity stripe. 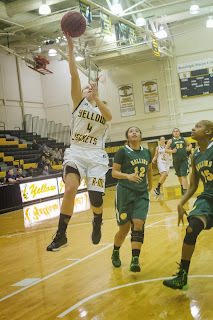 The Jackets, currently ranked 20th in the USA Today Division III Top 25 Poll, had five in double figures. In addition to Parsons and Staples, Katie Anderson, Lauren Vugteveen and Lindsey Sharman each scored ten, Sharman with impressive presence in the paint, going 4-for-4 in her 13 minutes of action. Everyone on the roster not injured saw at least 12 minutes of playing time, maybe the most important statistic of the day going forward. Freshmen like Marisha Berry, Andi Prugh and Taylor Intermill, the latter coming off injury which forced her to miss the first several games, got a good chance to get their feet wet in ODAC play. The Jackets will break for exams, then head to Fort Lauderdale, Florida for the 2013 Cruzin Classic, where they will face Mount. St Vincent December 18th, then the College of New Jersey on December 19th. TCNJ has already defeated fellow ODAC member Lynchburg College in the Marymount Tournament to open the season November 15th and are 5-2 overall. Last year they went to the Sunshine State and went 0-2. They look to reverse that this year, keep their Top 25 ranking, and bond even closer as ODAC showdowns loom after January 1st. The first major upset of 2013-14 basketball belongs to the #Atlee boys team! Brian Miller poured in 32 points as the Raiders knocked off host Douglas Freeman 64-60 to advance to the Rebel Invitational Championship Game Saturday night! Jarris Hendricks added 8 points, while Andrew Foster and R.J. Jenkins each had 7. The Raiders will play St. Christopher's for the title. The Saints beat Mills Godwin 74-60 in the other semifinal. Meanwhile, Hanover survived a poor shooting night to escape with a 56-54 win over J.R. Tucker in the Conference 20 Boys Tip-Off Tournament Semifinals at Glen Allen. Jalen Elliott led the Hawks with 24 points, while Jordan Wade added 15. After being behind much of the 3rd quarter, the Hawks' full-court defensive pressure eventually wore the Tigers down, create turnovers and transition baskets. 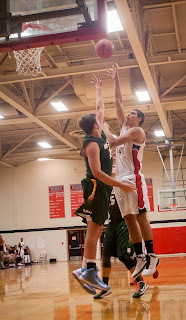 Hanover had 71 FG attempts in the game, Tucker only 43. So, even though Hanover shot 29.6% from the field and Tucker shot 44%, it was the Tigers free throw shooting that doomed them, going 9-of-16 from the charity stripe. The Tigers had the ball with 12.8 seconds left down two but never got a shot off as the Hanover defense knocked away a pass and the clock ran out. The Hawks (2-0) will face Glen Allen, 70-41 winners in the other semifinal over Caroline, in the 6:15pm championship game Saturday at Glen Allen. 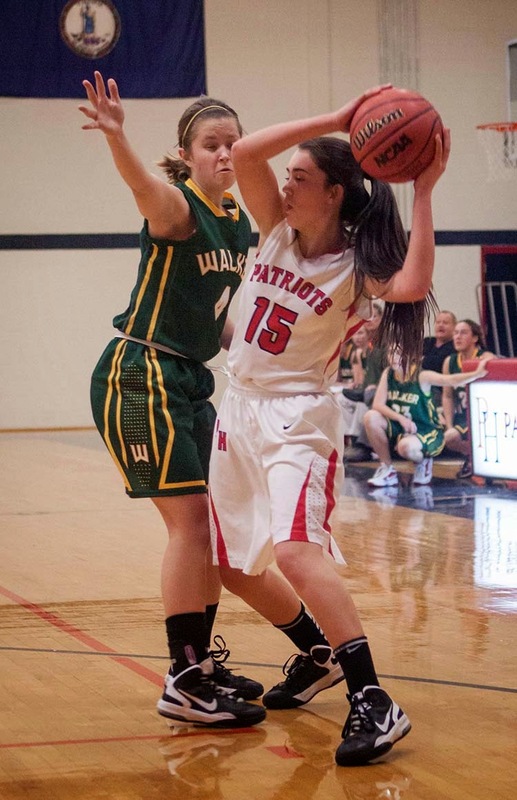 Amber Lee led Patrick Henry with 14 points as the Patriots won its first regular season game over Deep Run in two years, a 46-42 road win. Last season, PH defeated the Wildcats in the T-DIT Tournament and the Colonial District Tournament, but lost both regularly scheduled meetings. The Patriots improve to 2-0 on the young season and hit the yellow bus again Tuesday when they travel to Thomas Jefferson for a 6pm tipoff. Lee-Davis fell to 1-2 with another tough offensive performance, falling 40-30 at St. Gertrude tonight. The Confederates face former Capital District, and new Conference 11 foe, Henrico on the road Tuesday. The Atlee girls led at Hermitage in each of the first three quarters, but Destini Walker and the Panthers pulled away in the final stanza for a 56-45 victory to advance to 3-0. Atlee opens their home schedule with a Monday night matchup vs. Mills Godwin. 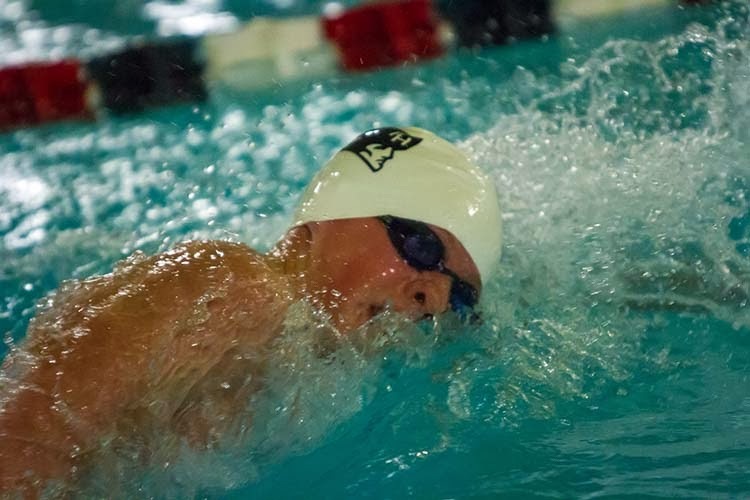 The Atlee Raiders began the 2013-14 aquatic season at the Brock Center at Randolph-Macon Thursday night, falling to Maggie Walker Governors School while defeating Goochland in a double duel meet. 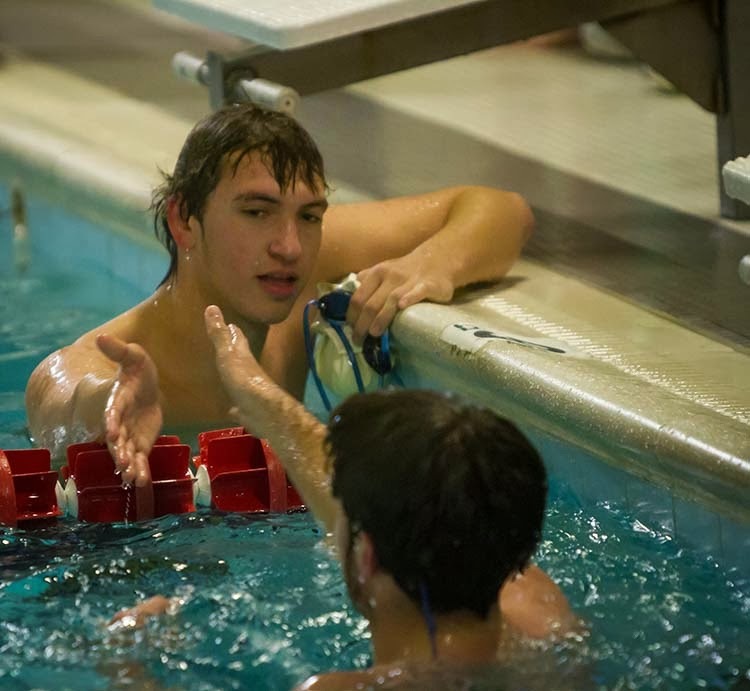 The Green Dragons won 194 to 146 over Atlee, while the Raiders defeated Goochland 261-70. 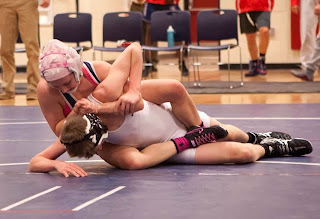 In boys action, the scores were MWGS 90, Atlee 80 and Atlee 130, Goochland 34. In girls action, it was MWGS 104, Atlee 66 and Atlee 131, Goochland 36. 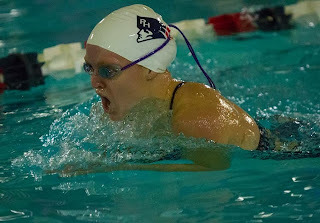 --Mica Baker was 2nd in the Girls 50 Freestyle in 27.00, losing to Livvy Call of MWGS by .06. --Michele Mackey won the Girls 100 Butterfly in 1:02.91. --Morgan Steiner won the Girls 500 Freestyle in 6:00.62. --Wyatt Grubb won the Boys 100 Backstroke by almost 5 seconds at 57.26. 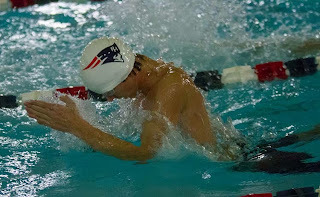 --In a photo finish, MWGS Boys 400 Freestyle Relay team nipped the Atlee team of Noah Mackey, Isabelle, Ben Whisnant and Wyatt Grubb, 3:33.66 to 3:33.94. 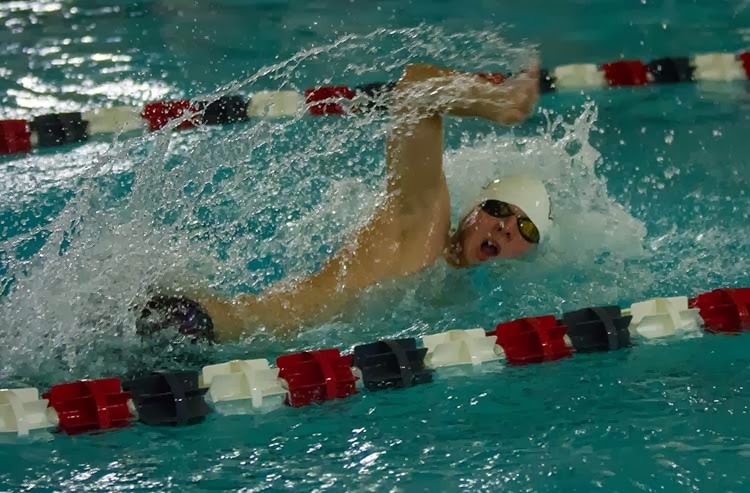 The Raiders return to the pool to battle rival Hanover next Wednesday, 12/11, at Randolph-Macon. Few times at the high school level do basketball teams overcome a 32-10 deficit. But the Midlothian Trojans did just that and turned a potential blowout into a classic opener tonight at Hanover. The Trojans came all the way back to tie the game at 69 late in the fourth quarter. But when it mattered most, Hanover shined at the free throw line and held on for dear life to win their season opener in the Conference 20 Tip-Off Tournament 77-73. Cutch Ellis, who briefly took the game over with 10 points in the first 2 1/2 minutes of the second quarter, led the way with 28 points. The Hawks had leads in the period of 26-8 and 32-10. But Hanover's achilles heel was fouls, committing 14 in the first half. Midlothian star guard Korey Turner would take advantage, hitting eight free throws and scoring 14 overall in the second quarter himself. His personal 10-point run helped the Trojans cut the lead to 12 by halftime, 39-27. Turner's dominance was key as Midlothian hung around and hung around in the third quarter, frustratingly unable to cut into the lead, but staying without shouting distance. They turned up their defensive full-court pressure as the fourth quarter began, happily trading foul shot opportunities for the Hawks for several turnovers, fueling the Midlothian effort. Luke Milanovic got hot inside, scoring 9 of his 15 points in the final stanza. It was down to five at 61-56 at 4:52 to go, then another 5-2 run made it 63-61. But freshman Jason Wade, who scored 12 points in his varsity debut, had a key steal and score to make it 65-61 with 3:15 to go. "I've known Jason for a long time, and he has a very high basketball IQ," Hanover head coach Darren Thornton said. "He's a very even-keel kid, plays hard, and plays the right way." Midlothian's final push was still to come, as another Hanover turnover gave the Trojans a shot at the lead with a trey. Sammy Hooper was fouled, though, and he responded with two free throws to tie the game 69-69 with 89 seconds left. It was now that the Hawks would be clutch from the charity stripe. Ellis was fouled and he hit two. Hooper traveled with 31 seconds left, forcing the Trojans to immediately foul Jalen Elliott playing the point. He nailed two from the line, the lead was back to four. Turner, who was money all night at the line, missed two free throws with 14 seconds left after a freshman mistake by Jason Wade, fouling him from behind bringing it up court led him there. The Hawks went 3-of-4 in their final free throws, and Turner nailed a trey, finishing the night with 32 points, as the final seconds ticked away. "We practice free throws every day," Ellis said after the game. "At the beginning and the end of practice we work on free throws, and it came in clutch." "It's always a good experience when you get tested like this," Thornton noted. "It's an even greater experience when you get tested and come away with a 'W'." Hanover, at 1-0, advances to Friday's winner's bracket to play J.R. Tucker, 52-39 winners over Powhatan in tonight's opening game at Hanover. Tip-off will be at 6pm at Glen Allen High School. Midlothian (0-1) will face Powhatan in the consolation bracket at 6pm Thursday at Glen Allen. Congratulations to the Atlee Raiders, who won their opening round game in the 2013 Rebel Invitational at Douglas Freeman, 60-54 over Collegiate. The Raiders advance to semifinal action Friday night, 6:45 at Douglas Freeman. In girls action, Hanover fell to Midlothian 87-37 in their season opener in a quarterfinal game played at J.R. Tucker. Hanover will play Powhatan in the consolation round tomorrow night. They tipped off for real tonight across the Central Region as the 2013-14 high school basketball season began in earnest. In Ashland, the Patrick Henry girls team begins what could be a special season with five senior starters and some exciting new talent. 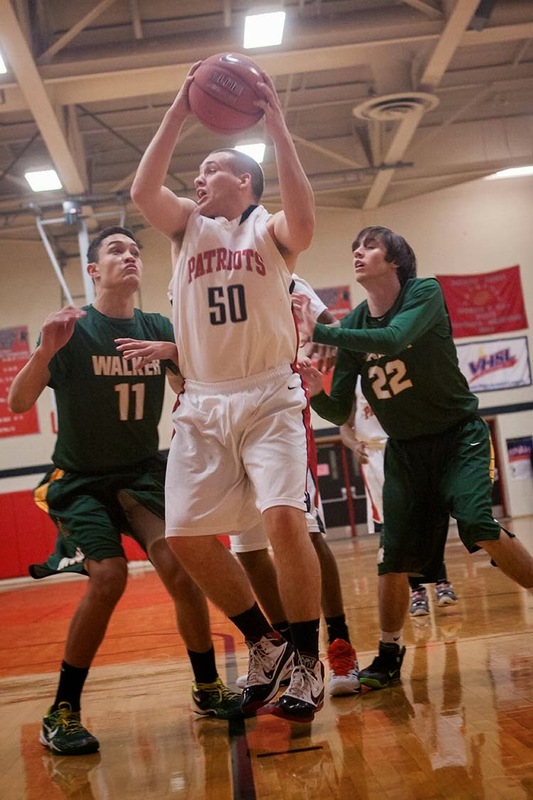 The Patriots raced on a 20-0 run in the first quarter en route to an easy 51-8 win over Maggie Walker Governors School. Summer Price led the Patriots with 18 points, while Amber Lee added 12, and India Coles had 9, all of them in that first quarter roll. "We're definitely pleased with the outcome", Patrick Henry head coach Phillip Cobb said. In boys' action, the Patriots broke open in the second quarter to take a 37-27 halftime lead on Maggie Walker, only to see their offense disappear in the second half. 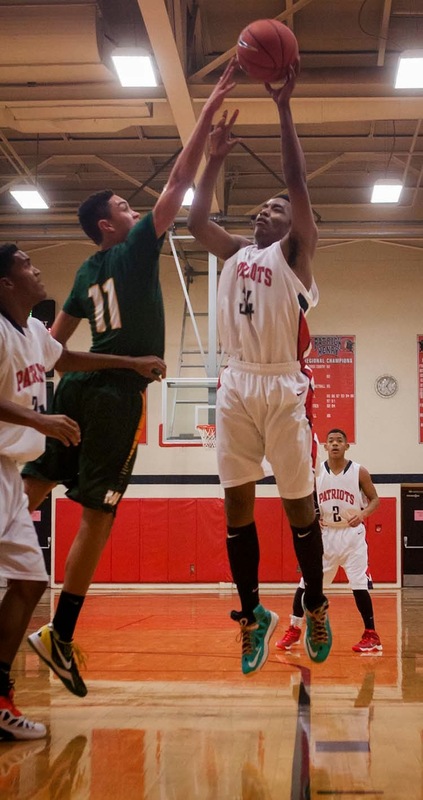 Their defense held off a late Green Dragon rally and Patrick Henry won, 47-40. Lucas Pienkowski led the Patriots with 19 points, all coming after he sat out the first quarter. Sophomores Jamal Foy and James Pinder each had eight points. Both Patriot teams step up in competition Friday when they travel to face Deep Run; the girls first at 6pm, followed by the boys game. 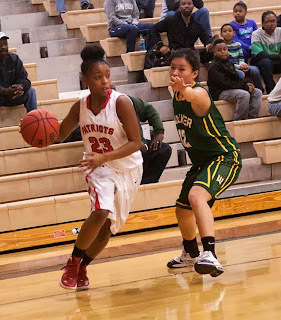 ---Lee-Davis' girls hoops squad began 2013-14 tonight with a defensive struggle, defeating visiting Dinwiddie 39-25. Olivia Tuck led the Confederates with 12 points. Lee-Davis next plays Thursday at home against Colonial Heights. 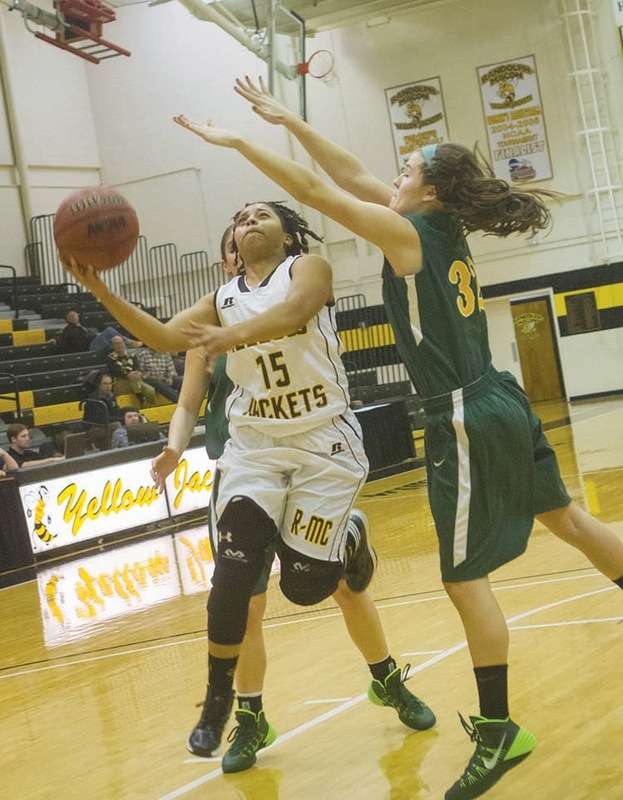 In college hoops, the "Patrick Henry Reunion" took place Tuesday night as Katie Anderson, Taylor Huber and the Randolph-Macon Yellow Jackets battled host Bridgewater, the new home to Tyler and Jasmine, the Pinder Twins, in ODAC action. It was Anderson who led with 19 points as the Jackets improved to 2-0 in ODAC play, 7-0 overall, with a 99-81 triumph over the Eagles. 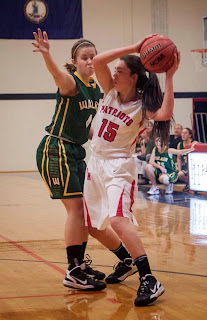 Huber added 18 as did Sarah Parsons, while Hannah Livermon had 16 off the bench. Jasmine Pinder saw six minutes of action for Bridgewater and had two rebounds, an assist and a steal, while Tyler played for three minutes. The Jackets now step up to face Division II Virginia Union in Richmond on Thursday at 7pm.